I’m nudging you! Step into the picture; take a walk on the wild side, and you might find it wasn’t as scary as you thought! One of three rustic and very eclectic benches in the garden. ‘The board was once used to manage the water levels in the nearby shrimp pond. With no power at Casa Loca and no way to access the photo files on the desktop, I have only one image (above) to share from this week. The blue-painted bench joins other rustic pieces of garden art from Playamart, and a few of those previous-used images join this one for today’s post. When the garden has few flowers, the colors jazz up the area. Hint: The mirrors show up best when used with dark colors. When the rains stop, I’ll take some new photos of the gardens. The plants have grown in huge leaps in the past month. Ah, there truly is something magical about the land on the equator! For a totally different timeout, check out a spectacular showcase of auroras from this past week: GEOMAGNETIC STORM AURORAS. Our power was restored for a few hours, but during the last rain session, a transformer blew. I am again typing on battery power and will put this in queue to publish in the morning. I truly am feeling much better! Thanks, everyone, for your concerns and best wishes. Art is where we find it, where we see it, and I never let anyone tell me any different. I love your repurposing of wood and bottles and even old pans. Thanks for sharing your colorful corner, and I’m very glad to year you are feeling better!!! you surely have lots of unique treasures you’ve discovered along the way. they also serve as little triggers that take us back to the day and memories of unique moments. Thank you, Anne! If you focused on art, you’d be equally inspiring… You keep us grounded from your unique gps setting across the pond! I’d love to see that headboard, and yes, there’s no doubt we’re related! There are many kinds of creativity. Yours takes the form of images, mine takes the form of words, though I do like to draw and used to be pretty good…..not bad?? I love your images and your use of what’s at hand. and you penned a very creative post this week – it’s still one of my favorites. maybe one day you’ll find comfort with that pencil again! thanks, hugh! I suspect a lot of people don’t explore their creativity because they think being creative means coming up with some enormous, important, never-before-done project. When you realize that even tiny things that you discovered just by playing around are creative, you are much more free to engage your own creativity. yes, it takes practice to create just for the joy of creating. you’ve published some great new work, and it’s strong and sensitive. i’ve had trouble getting a comment to reach you, one of the negative slices of life on the equator. I love your work, Lisa! And the way you think!! P.S. Glad you’re feeling better. ha.. it’s nice to have the freedom to act upon those creative whims. yes, feeling better, but still having sneeze attacks, etc – so weird that nothing showed up on the allergy testing…. I love all the creative things you do with your “findings” on the beach Lisa. I wish I could get a garden going out here but lack of water will prevent me from doing so. Up on the property there is no water or sources for getting it except during the monsoon season during July and August when you can catch the water coming off the roof.. I have to haul water in barrels up to the property and I have to ration it out to make it last. Would love to have my own water source but just not possible right now. Love seeing your great garden pics and reading your articles. Keep up the GREAT work little Sis ! karen, you are so kind to say that! you’re so talented in so many ways, plus you share your enthusiasm with others. those young ones remind us to keep it light and simple. i’m sure you had fun wearing the mentality of a 3-year old and painting for the fun of painting!!!! Oh, I can’t wait to say, “Lisa likes it!” Haha. I just recycled an old rake head today into a trellis for a climbing fern that was wilting in my backyard. Then, I stuck it in my shower. You never know what you can do with odd bits and pieces. Lisa, I want to buy one of your calendars that Bob showed on his blog. How can I do that? So glad to hear that you are feeling better. the rake head sounds like a lot of fun! photo photo photo when you’re finished. the calendars were a ‘test’ – the costs in manta were about 9 dollars each – difficult to justify, and that was without being bound .. there wasnt a place in manta to bind them. found someone in the usa to print them/bind them, but i ran into problems there too…. am still trying to figure out alternatives w/the printing. thanks so much for asking! Thanks Lisa for the nudge! Time to get some paint and splash it abound a bit! Art surely is everywhere. My compañero picks up odd things in his desert walks and creates art. Sometimes I am not very appreciative of what he drags in, but often he creates something quite fun. Guess I need to join him in this endeavor! Beautiful spirit, that’ you Lisa finding the joy and way to spread it through your wonderful creative world. Wonderful way to enhance your surroundings and keeping it simple – love it. Have a great weekend and best wishes that you stay healthy! Thanks Lisa.Your post will get people inspired. 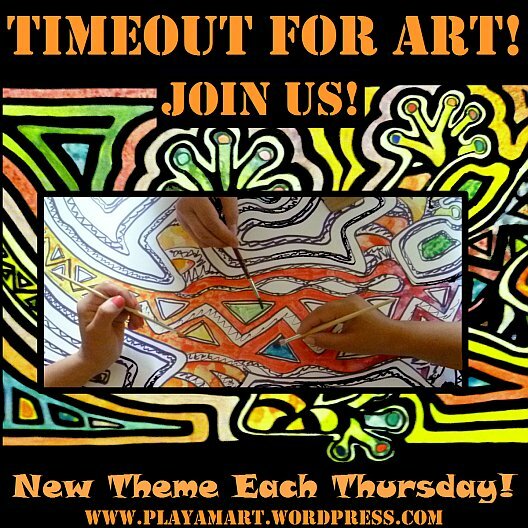 I have put a post in Time out for art, with the intention of getting people going. The out of condition and the people that use the mobile phone, as a toy, I wind them up a bit in my post. Like the picture of the young one wired for sound on the phone with parcels advertising an up market shop. We are traveling again so there will few posts from me. My pommepall will no doubt. some how keep posting. I will just keep looking in on what my blogging friends are doing. After posting about what goes on in the inside of refurbished refrigerators, I posted tonight about the outside of the fridge, and its role in creativity. There’s a direct connection between your blue nosegay jar and a poem posted on a fridge — both point to using what’s available to reshape the reality around us in ways that are pleasing and beautiful. You’re one of the best at doing that — thanks for the continual inspiration, even when you’re a little under the weather, both literally and figuratively! hey amiga! we’ve had more power problems at the house this week – power was restored around 11:30 today… grrrr.. but if that’s my biggest problem (that and internet) then i”m very lucky. i was so happy to see your post arrive, and the page has loaded so i’m heading there soon and look forward to reading another treasure of a post! thanks so much for your support and your friendship.. btw, you would ‘hold your own’ on many of the discussions on robert scribbler regarding our climate.. much is a bit over my head (to join – ahem, don’t open mouth and remove all doubt!) but many times i think of you and speaking up for what you’re seeing/witnessing in your area. Thanks for great food-for-thought; ha, I write this while in Guayaquil and I realize at one in the morning that I’m literally and figuratively hungry! A good friend arrived tonight from New York, and it’s going to be fun to introduce her to the people in my area. She’s very creative as well, so maybe we’ll come up with some novel ‘Timeout for Art’ projects. I enjoyed both of your refrigerator posts, but I enjoy all of your posts! No nudging needed for me. My life and work is all about creativity. I love the colorful work you do. There is so much fun, play and happiness in all your work. Donna, I love your new wildlife pics site, which marries well with your gardening one. When I have decent internet (ha) and can juggle a ‘birds with personality’ post, I’ll lob back to you, as your posts deserve a much-greater audience. This is one of my favorite sites. The content is always interesting, & I love the artwork. I found this post especially interesting, & thought you might like to read it also. What a visually inspiring post, Lisa. You and Oscar Wilde together make a powerful team; his words, your art. I’ll be thinking about this all afternoon as I do my writing! Thanks, Marylin! I’ll be happy to share any stage with Mr. Wilde! Sending you strong colorful energies as springtime heads your way! I loved your post, and it’s lingering in my thoughts as well! Thanks for this beautiful post. 😄. I love your garden and am inspired to paint some objects for my garden now. You are right it is important to take time out to be creative every day. Your positive words are a joy. Art is it’s own reward. Thanks again for your upbeat attitude and beautiful artwork. You lead the way! Thank you, dear -kind-and highly-talented Maria! I am sure that you’ll soar with your plans to punctuate your gardens with some fun works of art! I love how colourful everything is–love love love the table and bench. What strange places Internet searches sometimes take us to. Thank you so much for adding this to the post, and it’s great advice, and yes, an interesting title! I should share that with everyone on a future post. You are an inspiration! If you, with crazy internet access, black outs, and all that you do, can create such incredible art, then I can certainly take Time Out For Art. you are great and all but made me cry as i sit here in a public restaurant! am working on the timeout now but think i’ll work on it on the bus and publish it when i reach jama later today.. thanks so much, amiga!